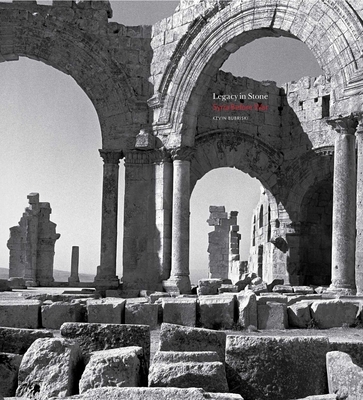 Legacy in Stone: Syria Before War is a collection of 100 black-and-white photographs immortalizing the ancient monuments of Syria. Kevin Bubriski was on assignment in Syria in 2003, during the infancy of the U.S. war in neighboring Iraq. He was photographing the country’s ancient monuments, as well as documenting the daily lives and ordinary human stories of its citizens. Unbeknownst to him, within the decade, a war would break out in Syria, and destroy or damage much of what he had photographed. Until the Syrian civil war in 2010, the Suq in Aleppo was considered to be the longest continuously inhabited place of commerce in the world, existing for well over two millennia. Bubriski photographed the Suq while it was still thriving, teeming with merchants and artisans. He also captured stunning, decisive images from the Dead Cities, the basilica of St. Simeon, the pilgrimage sites of Serjilla, al-Bara, Kharab Shams, Mushabak, Baqirha, Qalb Lozeh, Resafe, early Islamic sites near Raqqa, and the ancient Roman trade cities of Apamea and Palmyra. Bubriski recalls a special sense of discovery and awe being in a place of such rich history and haunting beauty. He remembers holding his breath and seeing the ruins take shape on the ground-glass of his Hasselblad camera as he gathered and preserved these sites forever in photographs. Kevin Bubriski’s fine art photography is in permanent collections at the Museum of Modern Art, Metropolitan Museum of Art, San Francisco Museum of Modern Art, and Bibliothèque Nationale, Paris. He is a recipient of Guggenheim and NEA fellowships. His books include Portrait of Nepal (Chronicle Books, 1993), Pilgrimage: Looking at Ground Zero (powerHouse, 2002), and Look into My Eyes: Nuevomexicanos por vida 1981-83 (Museum of New Mexico Press, 2016). His retrospective monograph Nepal 1975-2011 was published by Radius Books and the Peabody Museum Press of Harvard University in 2014. In 2016-2017 Bubriski was a Senior Scholar Fulbright Fellow in Nepal, where he pursued his independent fine art photography in Nepal’s remotest regions. Bubriski lives with his wife in Vermont. Amr Al Azm was educated in the UK, at the University College, London and graduated with a doctoral degree in 1991. He was the Director of Scientific and Conservation Laboratories at the General Department of Antiquities and Museums (1999–2004) and taught at the University of Damascus until 2006. Currently he is an Associate Professor of Middle East History and Anthropology at Shawnee State University in Ohio and a keen follower and commentator on current events in Syria and the Middle East in general. Amr Al-Azm is a founder and board member on The Day After project (TDA) and currently coordinates the Heritage Protection Initiative (HPI) for cultural heritage protection in Syria. Ross Burns worked in the Australian Department of Foreign Affairs for 37 years until his retirement in 2003, with roles including Ambassador to Syria and Lebanon (based in Damascus, 1984–1987), as Minister in Paris (and Ambassador to UNESCO), and as Ambassador in South Africa (1992–95), Athens (1998–2001), and Tel Aviv (2001–2003). After his retirement, he completed a PhD at Macquarie University in Sydney on The Origins of the Colonnaded Axes of the Cities of the Near East Under Rome. He is the author of Damascus (Routledge, 2004) and Monuments of Syria (3rd edition, 2009).